Slightly Jet Lagged: The Travel Sketchbooks of Mike Lowery (by Mike Lowery, featuring Mike Lowery) is a super-high-quality, full-color book with tons of drawings, comics, and notes from all over the world. It's 120 pages and hardbound. I mentioned in the video that I broke my tooth in the jungle in Cambodia. This is NOT a joke. Want to hear the whole story? BUY THE BOOK. (sorry I can't give away ALL the good stuff for free!) It's full of comics and journal drawings from tons of places: All over the US, Norway, China, Japan, Germany (where my wife is from), Portugal, Iceland, Canada, Mexico, the Caribbean, Central America, Russia...you get the picture! Hey everybody! Tomorrow night I’ll be making a short presentation about Slightly Jet Lagged and how to keep a travel sketchbook. And I’ll be talking about a new book with Lonely Planet! 6pm Saturday, March 16 at Little Shop of Stories in Decatur, GA.
Come spend an evening with author, illustrator and world traveler, Mike Lowery, on March 16th at 6pm. Mike will launch TWO new books: "Slightly Jet Lagged," a collection of Mike's travel sketches, and "American's National Parks," by Lonely Planet. 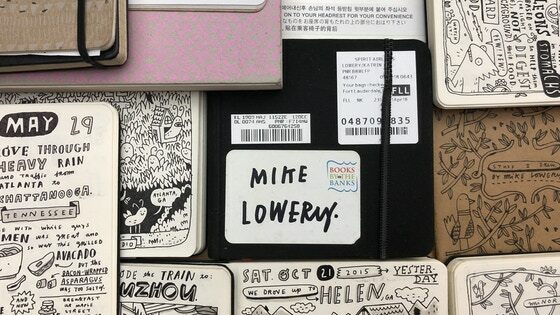 At this all-ages event, Mike will share stories from some of his trips, discuss his practice of keeping a travel sketchbook for over two decades, as well as sign (and draw in) his books. Mike is a New York Times best-selling (and best smelling) illustrator, and lives right here in Decatur. He has worked on dozens of books for kids and adults, including "Mac B Kid Spy" by Mac Barnett, "The Gingerbread Man: Loose in the School" by Laura Murray, and his own title, "Random Illustrated Facts." And he’s currently working on a new series of books for Scholastic called EVERYTHING AWESOME! Hey everybody! I’m super excited to let you all know that the orders are currently being processed and that roughly half of the books are in the mail. In fact, some people have already let me know that they’ve gotten them. I still have a LOT of books to draw in, but they should all be shipped by early next week. I’ve said it a bunch already, but thank you so much for supporting this project. Take a trip to Parma, ITALY! And book update! That's all for now! Thanks so much for backing this project! I'm excited to get to send them to you very soon. THE BOOKS ARE (ALMOST) HERE! A really big update! Hey everybody. I've got a big update for you. The books are aaaaaaaalllmost here! Last week my wife and I packed up our kids and house and our studio (the kids didn't go into boxes) and we moved everything roughly three streets over to our new place. While unboxing everything I got a small, manila envelope from China in the mail. What was inside? THREE ADVANCE COPIES OF "SLIGHTLY JET LAGGED"! Lots of folks asked about stretch goals, and since it was my firts kickstarter, I wasn't exactly sure how to promote that. Instead of adding in little extras like bookmarks, etc...I decided to use additional funds to make the book MUCH nicer. If we'd just met the original goal, it would have been a VERY ACCEPTABLE book! BUT, we smashed that original goal and we made it really incredible. We added a cloth binding with screenprinting and super high-quality paper for the cover and insides. I absolutely couldn't be happier with the way the book turned out. The paper is awesome. The colors are perfect. It even smells nice. Here's a little sneak peek video! So, what happens next? In the next few days, you'll get an email from me through a service called Backer Kit. Keep an eye out. This will be how I get your most current mailing address AND you'll have an option to add more books OR a copy of the "How to Keep a Travel Sketchbook" booklet and one little surprise thing. The books are scheduled to arrive at my studio MID February and orders will start going out immediately. Folks who don't confirm their addresses might have delayed shipping, so be sure to respond that that survey asap once you get it! I wanted to say THANK YOU again for supporting this project. I couldn't have done it without you all. Well, and I wouldn't have done it, because then I'd just have hundreds of books at my house for no reason. But seriously, THANK YOU. One more tiny thing! I'll be sending out an update in a few days about a trip that I'm leading to Parma, Italy that focuses on Travel Sketchbooking! It's planned and operated by a group that's been running artist-lead trips like this for a really long time and I can't wait to share more details about it. I'll send an update soon. Lastly, check out the cloth back of the book with a white screen print of an old building I drew while in Russia. Hey everybody! It's been a while since I've sent out an update, so I figured I would fill you in on what's going on with the book. First off, the book is ON SCHEDULE and WILL ship in FEB 2019. Possibly even a little bit sooner! I will be collecting updated payment info, shipping addresses and giving you a chance to add more copies of the book and other stuff in late December or early January. The final illustration and design work wrapped up a few weeks ago, and the final files have been delivered to the printer! I will be collecting updated payment info, shipping addresses and giving you a chance to add more copies of the book and other stuff in late December or early January. We looked at TONS of paper samples and binding options, and we picked some really awesome stuff. Over the past few days, we've gotten in a bunch of the rough print samples and I wanted to show them to you. Okay, now some shots of the book. Here's a close up of the cloth binding that will be used on the spine and the back cover. This little drawing from my trip to Russia will be screen printed on the back! This one's a little confusing, but it's a close-up of what the binding will look like. HOWEVER, they just used stock fabric. The final will be the navy shown in the picture above. And lastly, we got a HUGE sheet of uncut pages to proof. Thank you so much for supporting this book!